After graduating from Liverpool in 2009, Andrew spent two years in mixed practice in the Midlands and Ireland. Then spent two and a half years in first opinion small animal practice. 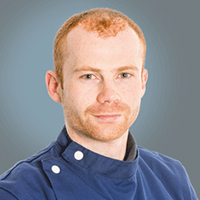 Andrew passed his BSAVA PGcert small animal surgery in 2014. After completing a one-year internship then a three year residency here at SCVS, he passed his ECVS exams in 2018 making him a European Specialist in Small Animal Surgery. Craig A.. (2015) Sagittal accuracy of tibial osteotomy position during in vivo tibial plateau levelling osteotomy performed without an alignment jig and cutting guide. Clinical Research Abstract. British Small Animal Veterinary Association, Birmingham, UK. April 2015.